Rescue – our specially-trained crews are the only group authorized by the National Marine Fisheries Service to rescue marine mammals along 600 miles of Central and Northern California coast. Rehabilitate & Release – we help give our patients a second chance at life, and once they're healthy return them to the ocean as wild as when we rescued them. 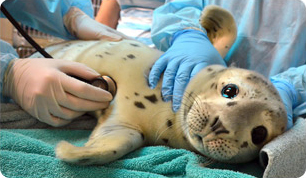 Research - each animal in rehabilitation offers our researchers a unique window into marine mammal and ocean health - a connection we all share. Teach - education programs promote an understanding of the interdependence of the marine environment and the survival of all life.